During the summer holidays, we were asked to complete a JungleMulch makeover on part of the outdoor play space at an academy school. The existing area was attractive and used frequently by the children, but had varying ground levels and was mainly surfaced in natural bark chippings. 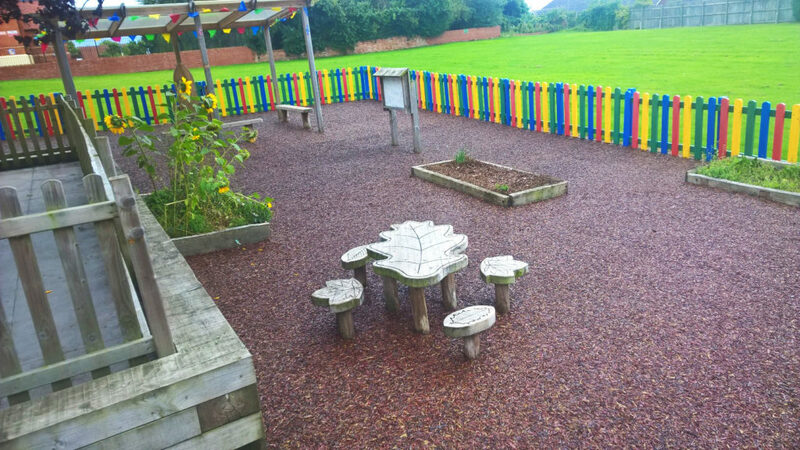 We’re often approached by educational facilities using bark chippings to suggest an alternative natural looking surface, as the areas require high maintenance and it can be costly to keep topping up material. As the product is loose, this brings its own problems as it has a habit of spreading from the intended area, being picked up by little hands and appearing in unexpected places! We’ve also had schools in the past that have raised concerns about very young children putting pieces in their mouths, or people getting splinters from the bark. As a fully bound, solid surface, JungleMulch reduces the loose pieces present and is very low maintenance. In this instance, there was already high-quality timber equipment in place that didn’t need updating, alongside some lovely planters to add interest. JungleMulch allows you to maintain such existing items as you can surface right up to them. Our team levelled out the ground and removed the existing bark, providing a new base for our mulch installation. We then surfaced the entire area in our Original JungleMulch blend which sits perfectly alongside the wider environment and school. 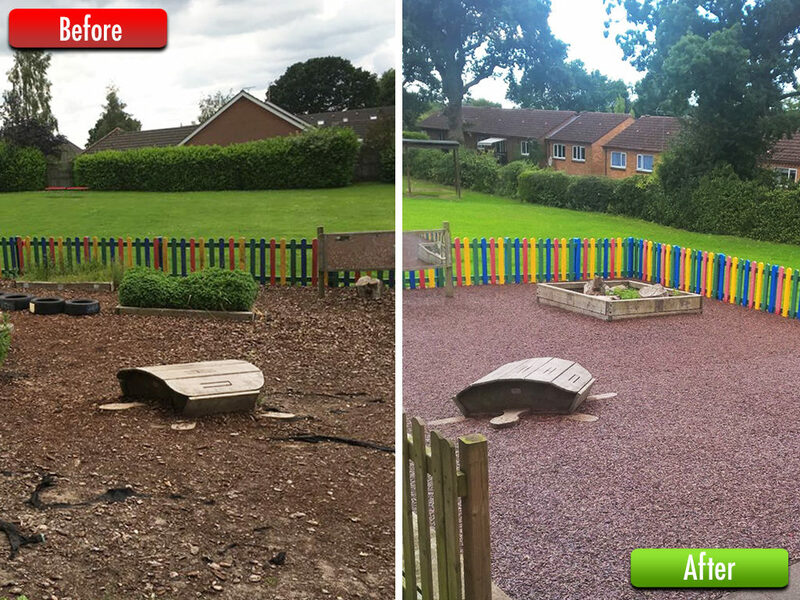 If you’d like advice on rubber mulch as a school playground surfacing solution, please feel free to get in touch! You can reach our experienced team directly via the contact page, or call us on 01564 742 811. As an alternative to mulch, we’d also recommend taking a look at eco-friendly grass mats. We’ve even produced a handy guide specifically on the benefits of them, it’s completely free and you can download it here.